Adam was four years old and two days, blissfully playing in pre-school, when the plane hit the first tower on that perfect September Tuesday of the cloudless, blue sky. Anna was in second grade. When I heard the news about the first plane, I thought a small aircraft had veered off course. Then another plane hit the second tower. I needed to be with my children and I had to find Ken. I called Stockholm and told the hotel operator that I was calling from the United States. “I’m so sorry,” said a woman’s voice. “Today we are all Americans.” Ken was in a meeting and no one there knew that New York City was under attack. “Turn on CNN right now,” I sobbed when he came on the line. Ken hadn’t heard yet. His European colleagues cried with him as they watched the Twin Towers collapse on live television. I collected my kids early. Anna’s school correctly understood that parents should be the first to tell their children about the terror attacks. I waited until we got home to tell Anna that the Twin Towers were gone. The towers had been her landmark of choice when she was asked to draw a famous building that she liked in first grade. And then Anna wanted to know if all the people on the planes and in the towers had died. In those days Ken was always on planes. He sent us postcards with exotic stamps. He brought back snow globes from his travels for Anna’s growing collection. 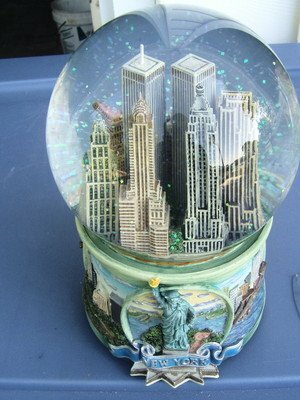 As it happened we had a spectacular snow globe of the New York City skyline, which thankfully helped me explain the enormity of what had happened that morning. When I shook the globe tiny pieces of red, blue and green foil fluttered in the water—pieces of foil that were shaped like the sun, moon and stars that I always want to give to my children. Like a lot of our culture–kitsch or otherwise–the snow globe originally hails from Europe. The first “snow dome” was exhibited in 1878 in the Paris Exposition. Eleven years later, at another exposition, the Eiffel Tower was the main attraction. Its doppelganger was a ceramic miniature replica swimming in a water-filled dome. The snow globe took off in Vienna in the 1890s after a man named Erwin Perzy was looking to create a cheap lens. Attempting to enhance the light he added white semolina, which put him in mind of a snowfall. Perzy’s first snow globe was a reproduction of a Viennese basilica. Today the Perzy family is still in Vienna producing 200,000 snow globes a year. The week of 9/11, Ken hopscotched across Europe for six days. When he finally got a return flight to Boston, we went to the airport with flowers and signs to welcome him. Anna was clutching her New York City snow globe. Three years later she would try to bring home a snow globe from Alaska only to have airport security confiscate it. No more than three ounces of liquid permitted through the gate. We mailed the snow globe home and it arrived in pieces. A lot has changed in a decade. Osama Bin Laden is dead. My children, on the verge of adulthood, know that Bin Laden’s death is momentous, but they wonder how much safer they really are. These past ten years they’ve been to Israel twice and on that first trip they noticed an army at work at checkpoints and street corners. They saw armed security guards posted at restaurants in Jerusalem. The other day my close friend, a Muslim, linked her arm in mine and said, “Let’s go to Israel together.” She’d love to see the Dome of the Rock and the Wailing Wall. I’d love to go with her. Until then we have to settle for shaking a snow globe and watching confetti-like snow blanket small-scale versions of our holy sites. This entry was posted in Uncategorized and tagged 9/11, parenting by judy bolton-fasman. Bookmark the permalink.